It has probably been over a decade since I put on a pair of climbing shoes, mostly because I found that catlike balance has never been my strong point. 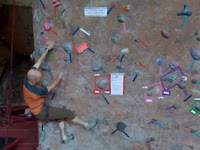 This theory was put to test on Thursday as I joined a group of coworkers at the climbing gym. *I have soft hands. I don't mean this in a good way. 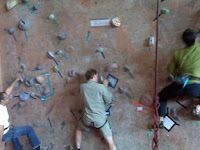 *Climbing indoor routes means a lot of checking holds for the color marking. Is this hold legal? *These self belay things at indoor gyms are cool, and a bit scary for awhile. *Can I get a foot reduction? To maybe a size 9?